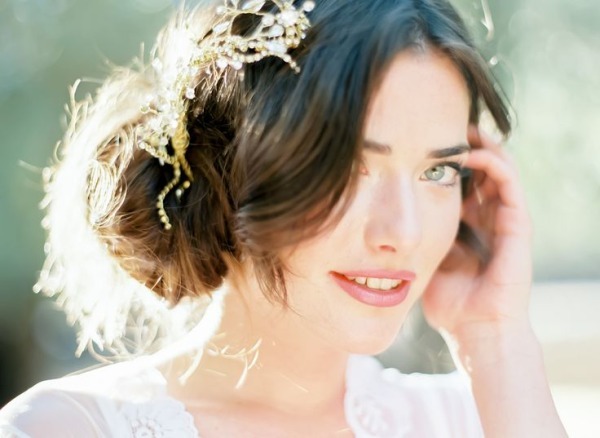 Are you looking for a wedding hair style of the prettiest kind? 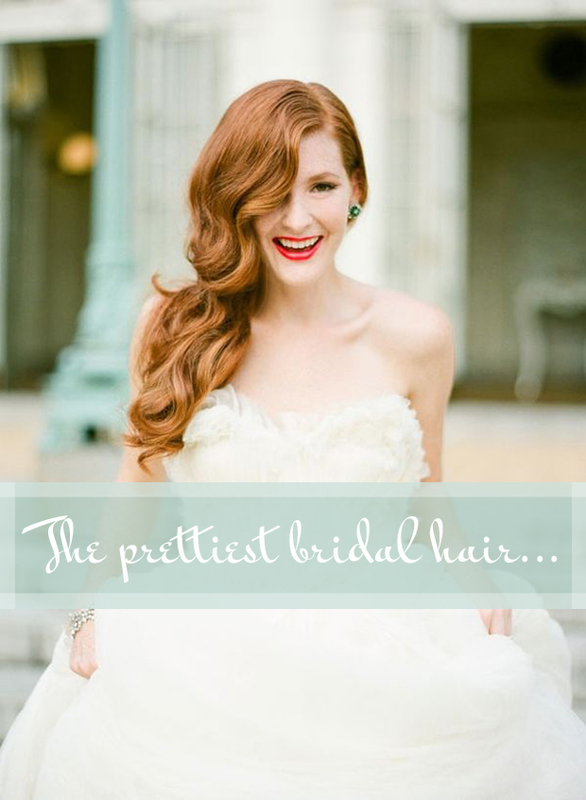 Do you want to feel amazing on your big day no matter what your hair type? Of course you do!! 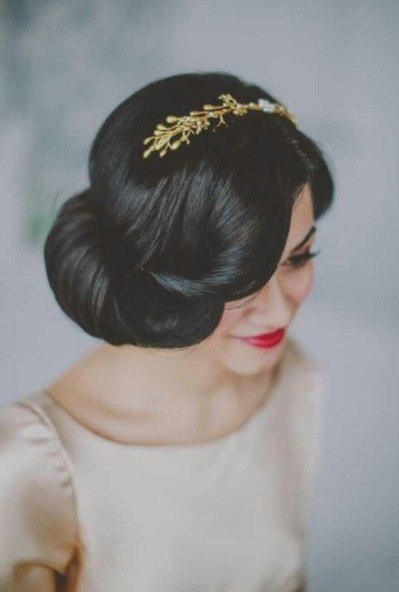 Long, short, bobbed or naturally curly, I’ve scoured the net to find you, the most inspirational, and the prettiest bridal ‘do’s’ around to suit your style. You’ll be looking like a goddess in no time. 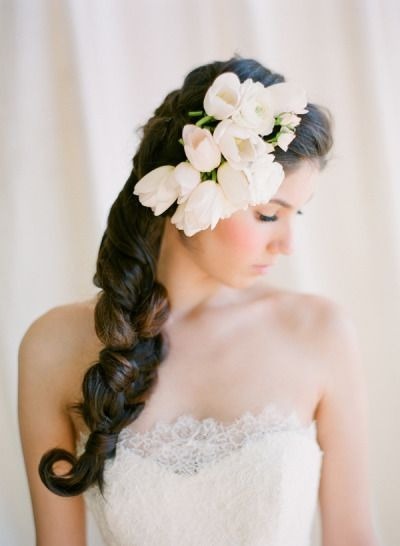 I absolutely adore bridal braids and think the added ribbon makes an interesting twist! 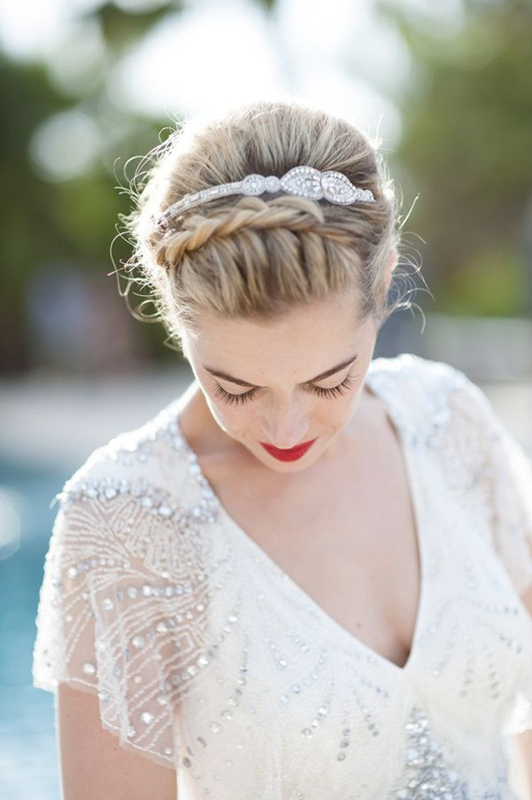 Or how about a bridal band braid? Sweet huh! 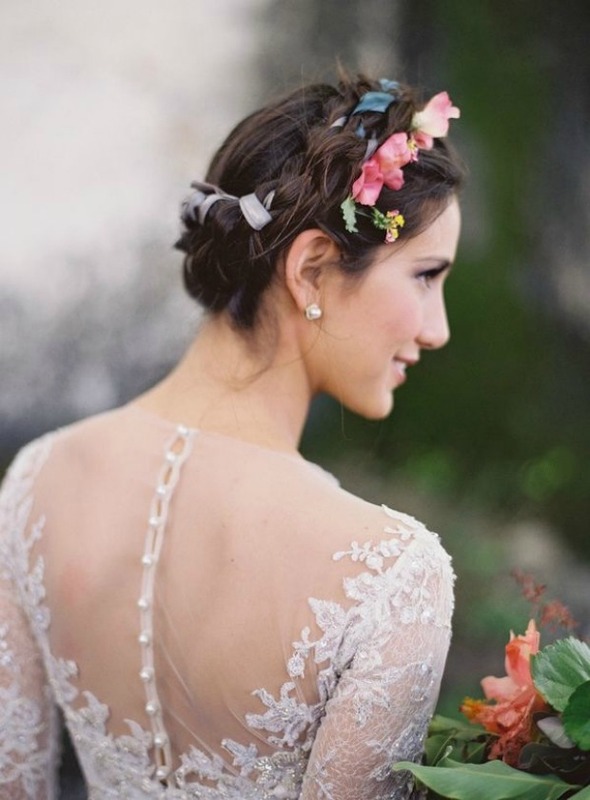 Wear your fishtail braid casual and loose or team it with a sparkly headband for a more glam look. 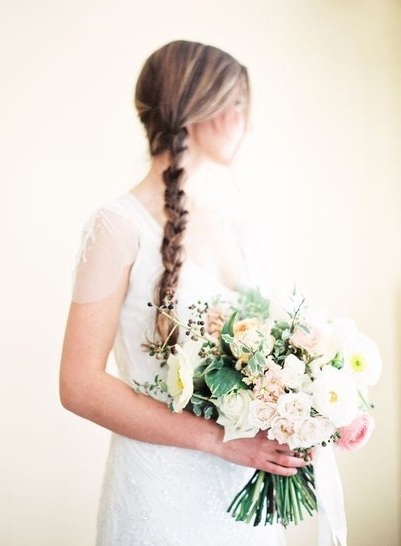 Have we all forgotten how romantic a good old fashioned plait can look? 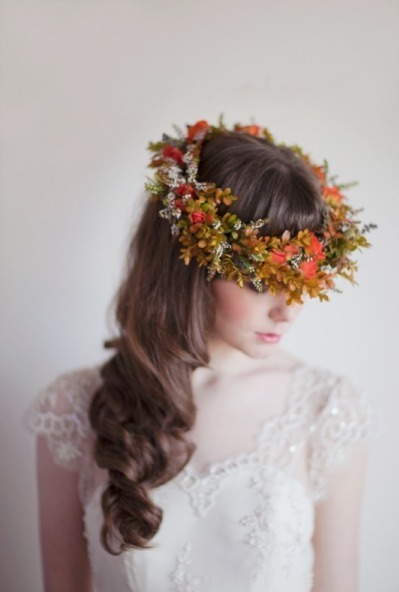 Wear yours super thick and extra long by adding in hair pieces. 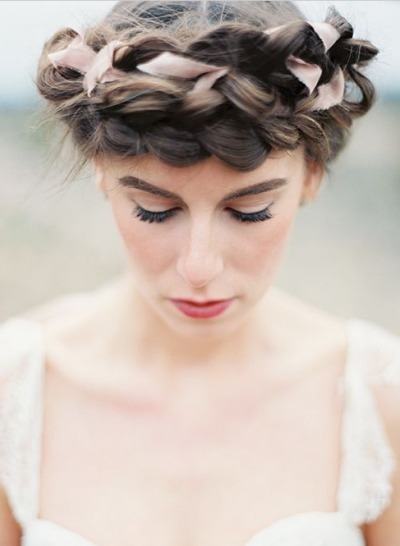 Or incorporate a humble plait into a more intricate ‘up do’. Always wear your hair down? 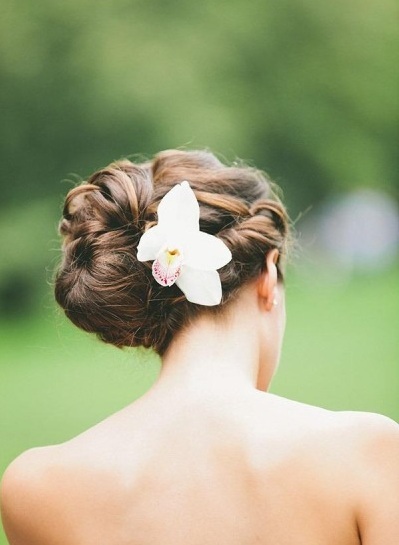 Ask your stylist to create a pretty little ‘up do’. 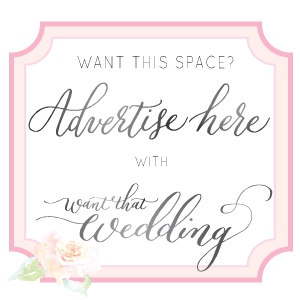 It’ll set your accessories off perfectly! 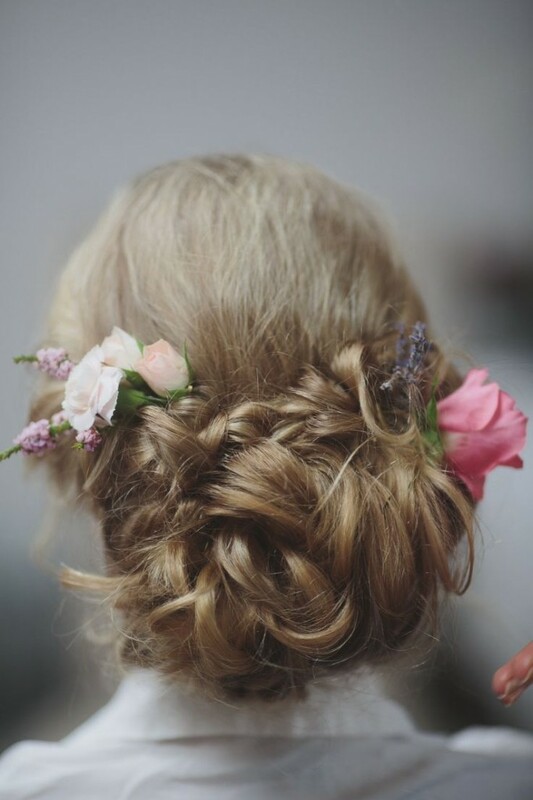 Whether your wearing your hair up or down, adding in twists and rolls is a super pretty idea and perfect for bridal hair! 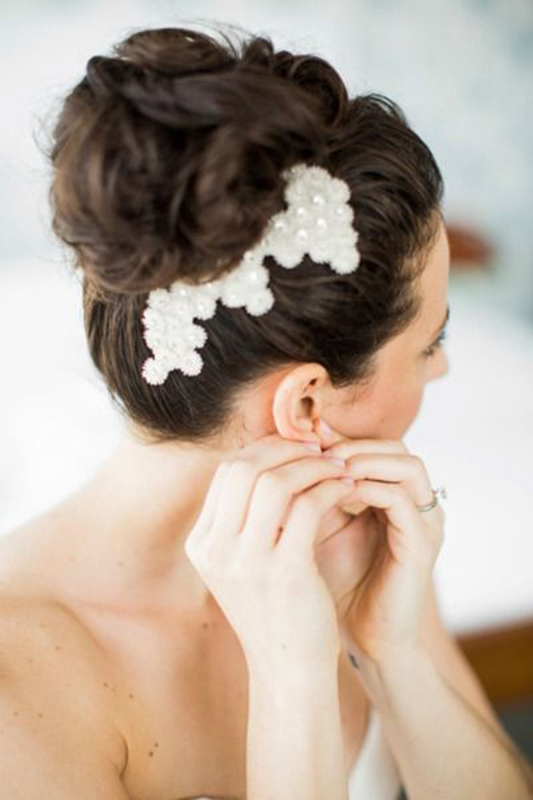 Don’t be afraid to rock a chic-er ‘do’ either. 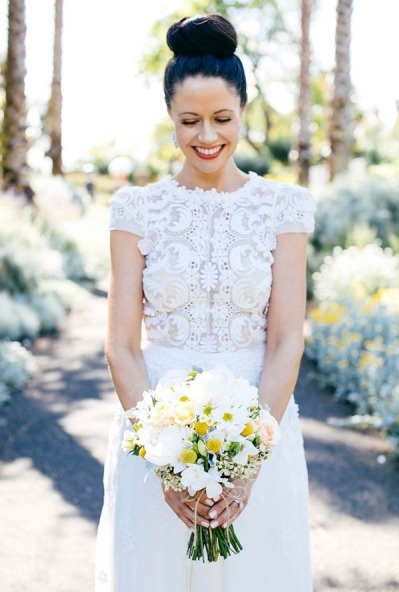 The chignon above is proper sleek, and I am all kinds of in love with this awesome bee-hive! Constantly slicking back your hair? 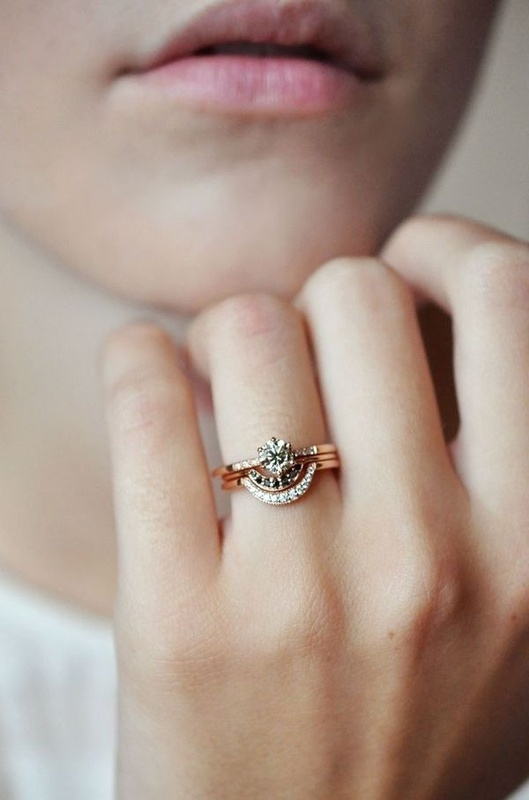 Wear it down on your big day. 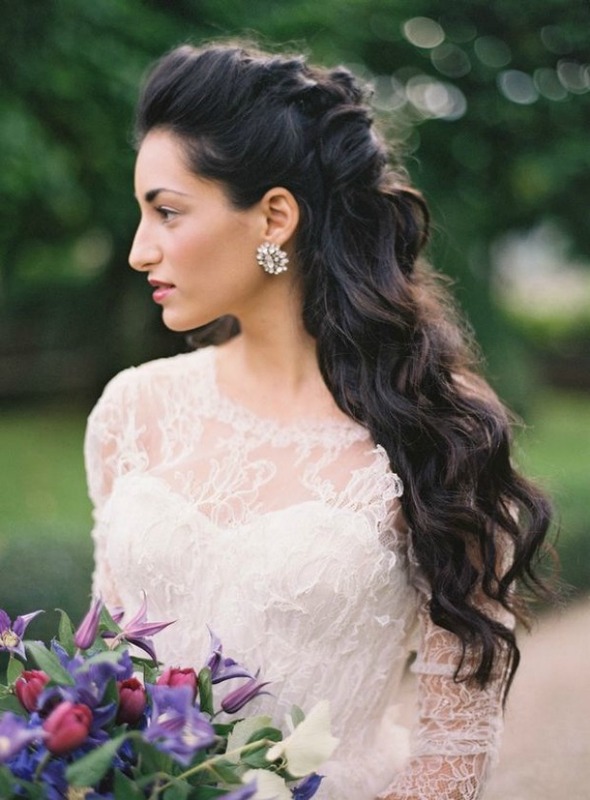 Loose style waves look amazing when swept to one side. Can’t make your mind up? 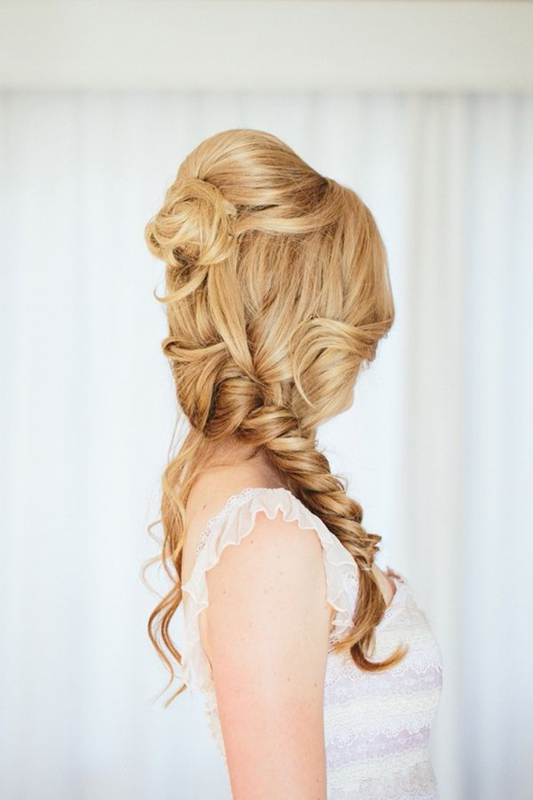 Wear your hair half up and half down. Result? 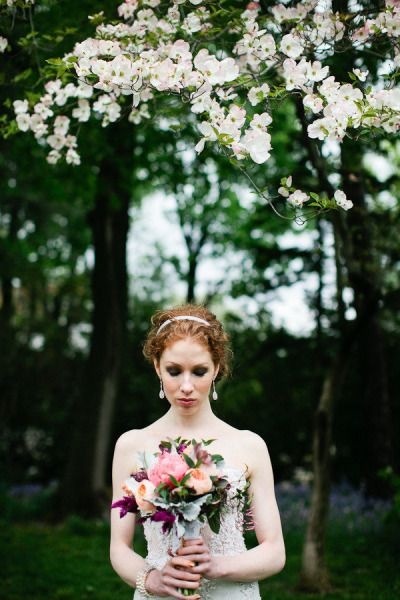 Absolute gorgeousness. 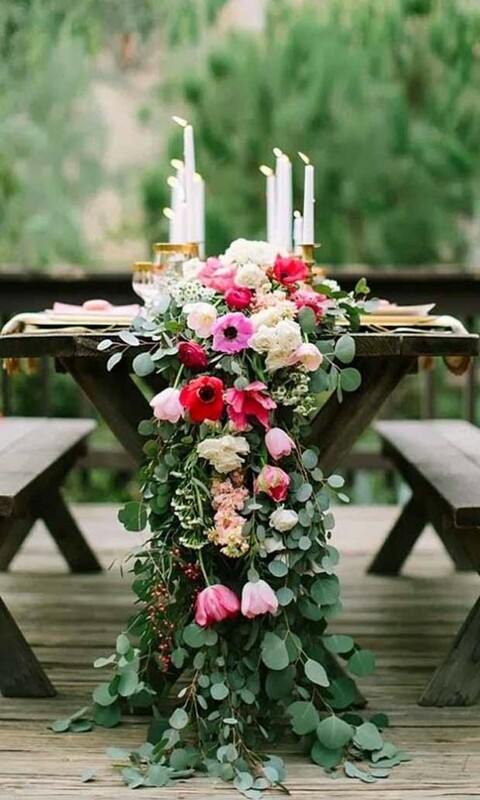 It’s your wedding day. 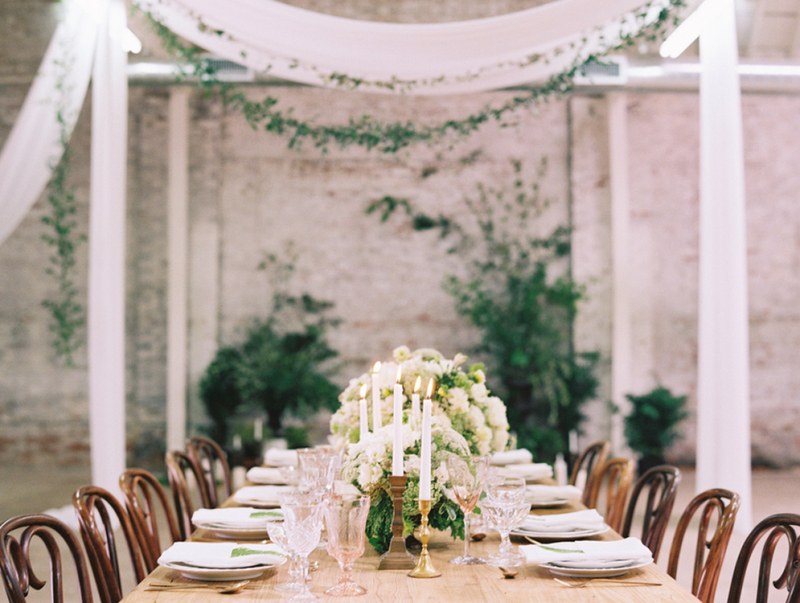 You only get married once. 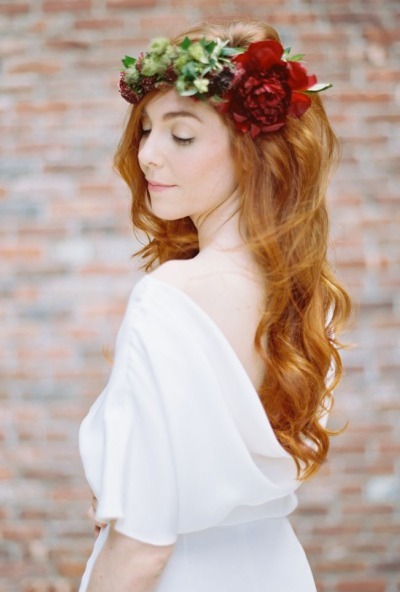 Why wouldn’t you want mermaid hair? 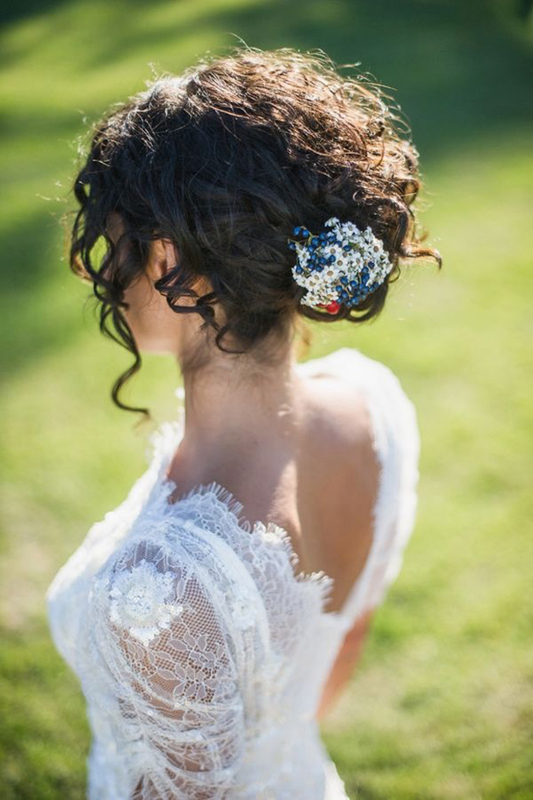 If you’re getting married in a hot climate, you might want to keep your hair away from your neck to keep your cool. 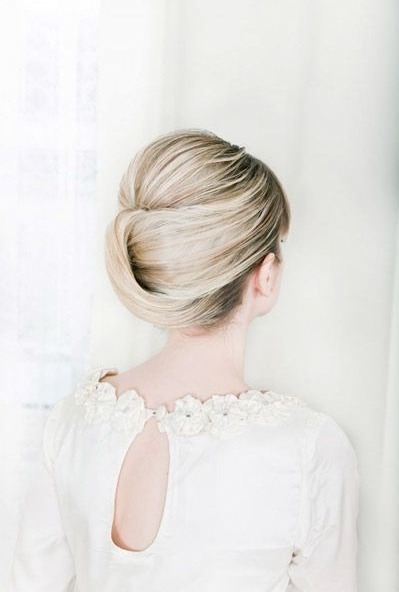 Bridal buns are a super chic option, just muss them up for a casual look or wear them sleek for an elegant look. Girls with curls? My advice. Don’t fight ’em. 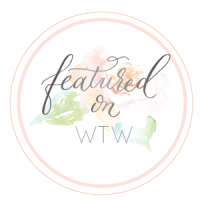 Work with them! 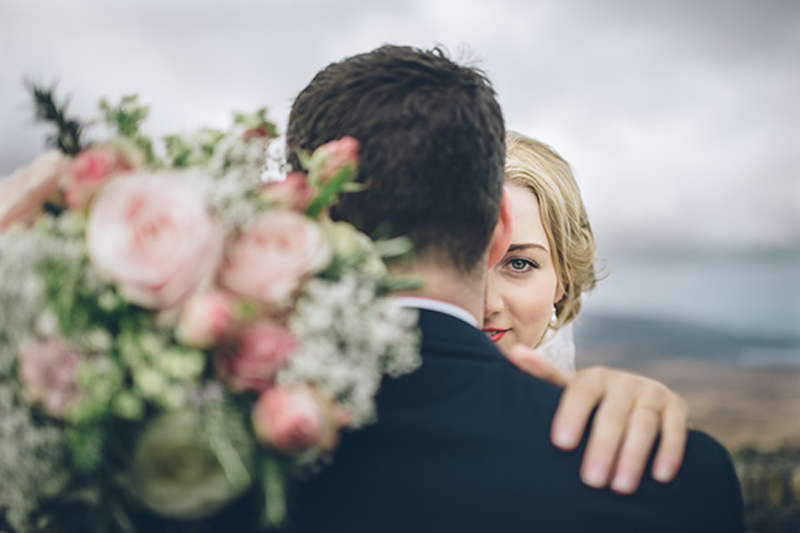 These gorgeous brides prove you can still have your pretty natural curls and look amazing with an ‘up do’ or pretty braids. I will reiterate my statement above. Don’t fight your curls. 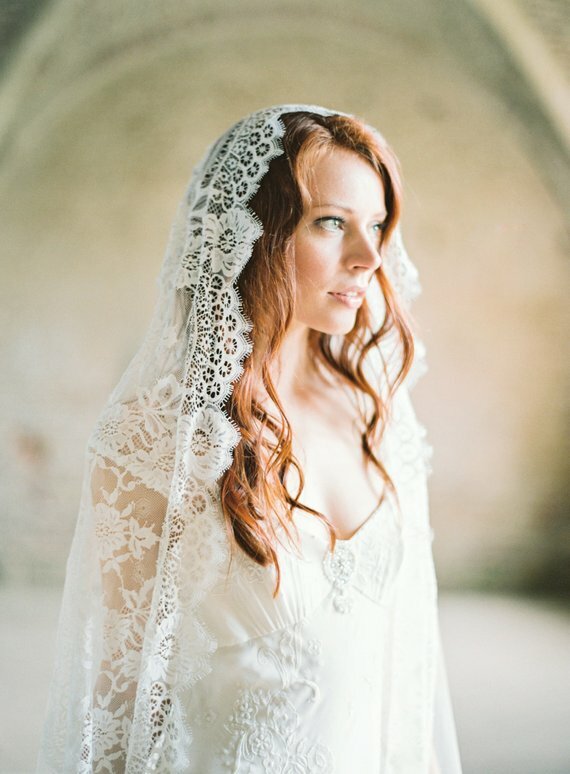 Brides look GORGEOUS with natural hair. 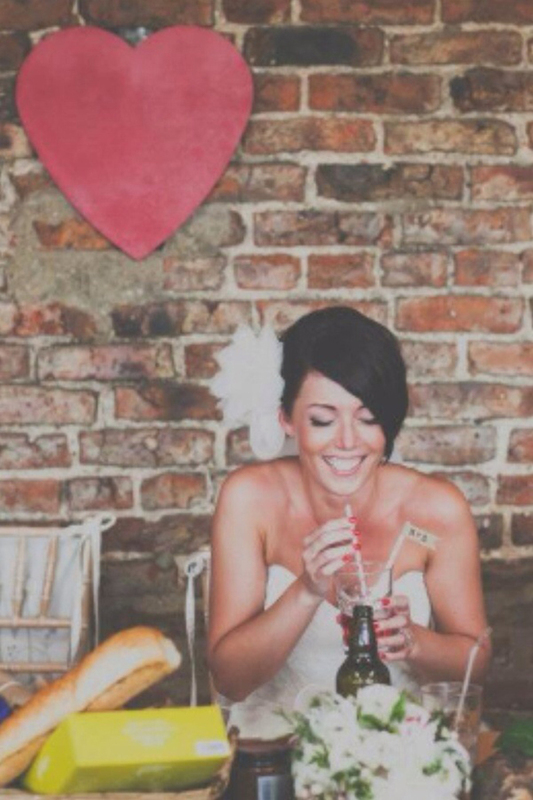 Just ensure you have a visit to the salon a couple of weeks before the big day for a cut and intensive conditioning treatment. I swear by Moroccan Oil! Do you have a long bob? 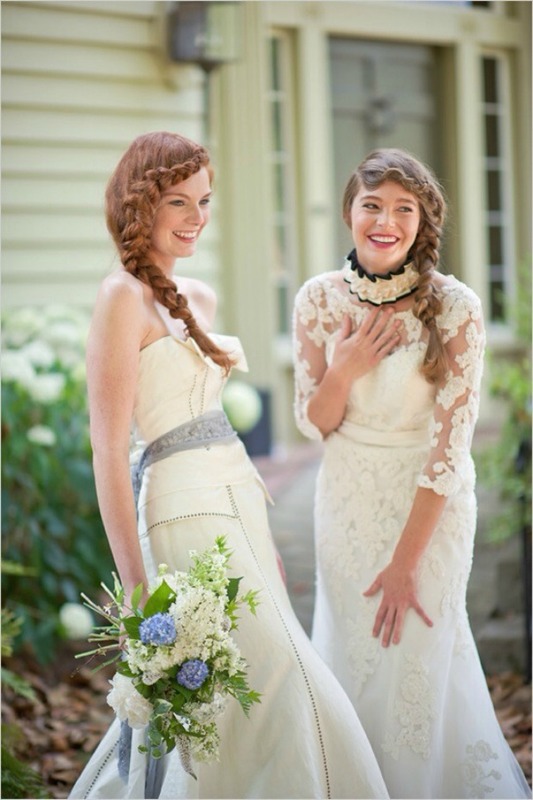 I love them styled with a vintage curl or a loose boho wave. 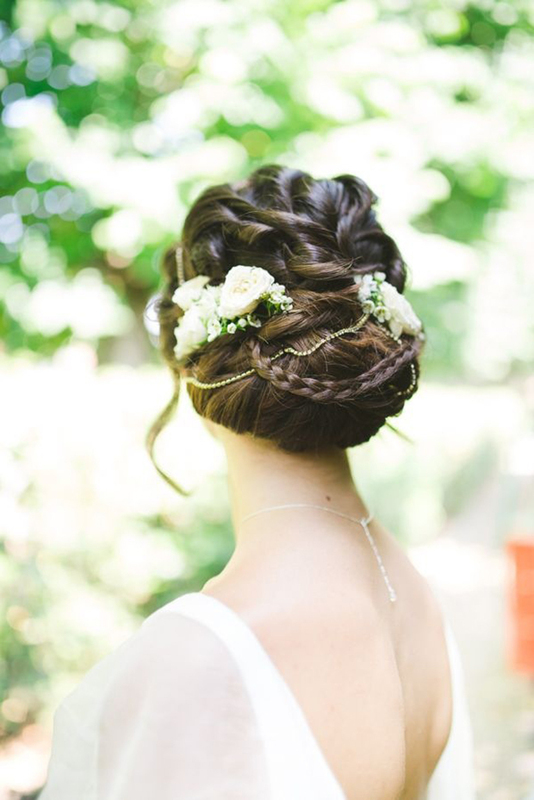 Still wanting an ‘up do’? It is possible. Yay! 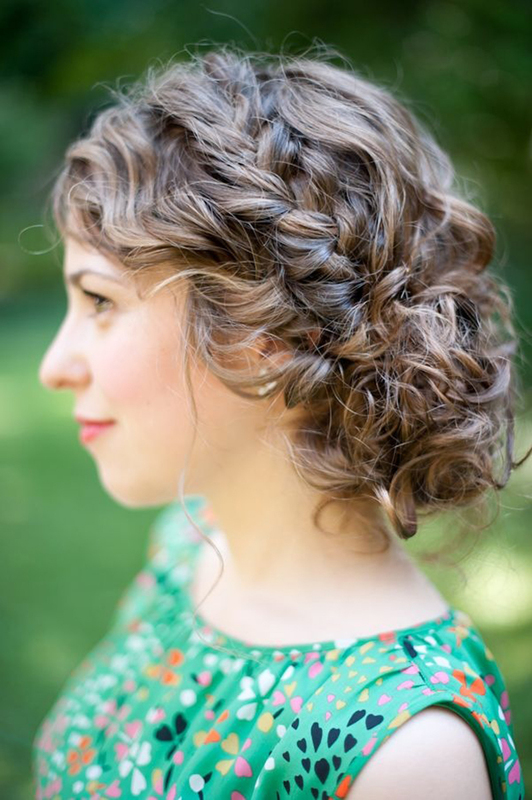 Ask your stylist to create small curls and twists and then pin to the nape of your neck for a ruffled loose bun. 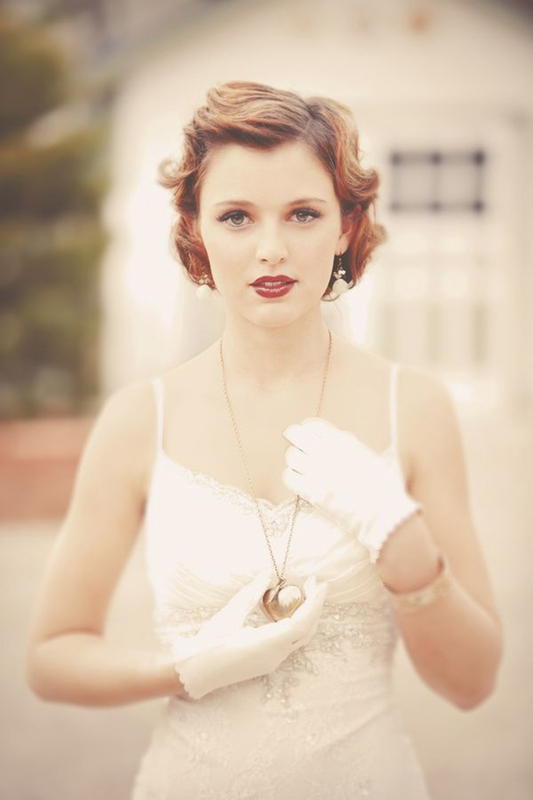 Vintage waves or ‘pin curls’ look amazing on short bobbed hair. 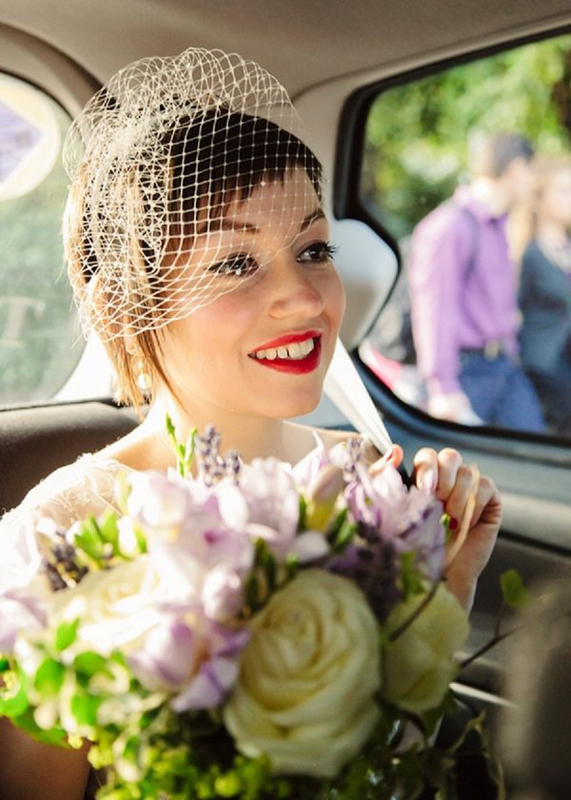 I also love how the bride above accessorised her chic graduated bob with an over-sized flower. 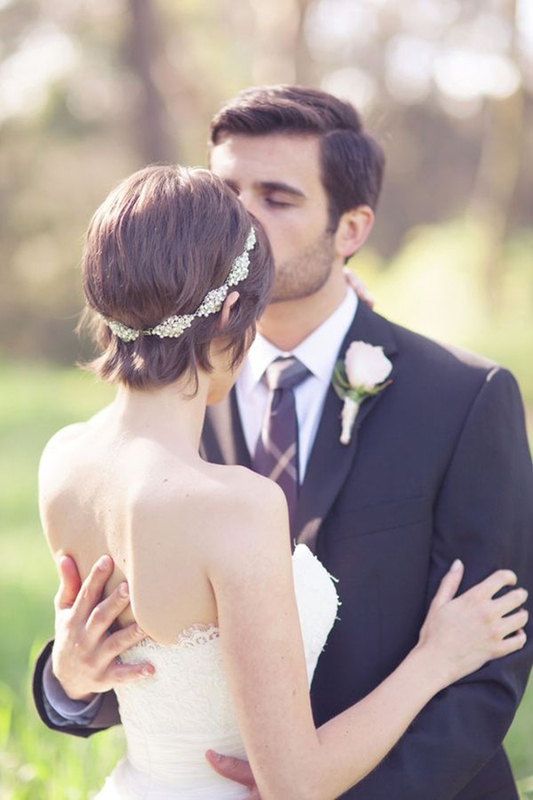 Who says short hair can’t be pretty on a bride? 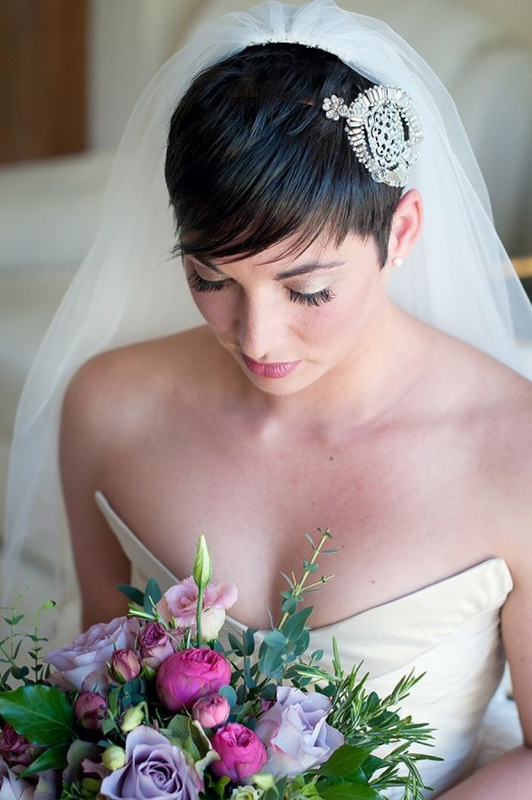 Cute little pixie cuts look uber-awesome with a statement bird-cage veil and really sweet with a pretty headband too! 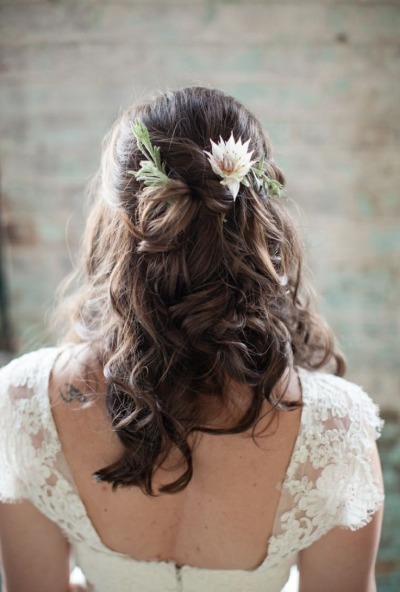 Long, short, wavy or natural curls, I hope you’re loving this gorgeous wedding hair inspiration and can find a style to rock on your big day! 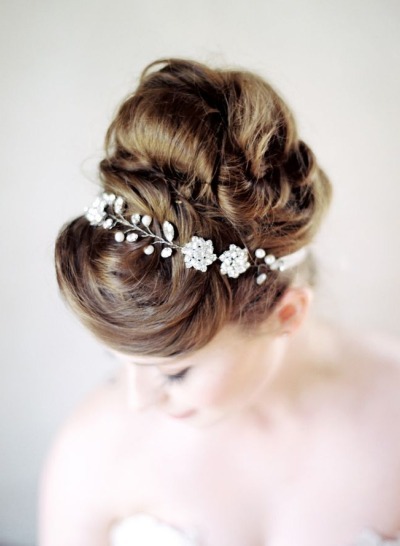 Need any bridal hair styling advice? Post your question below and I’ll find an expert hair stylist to answer it for you. 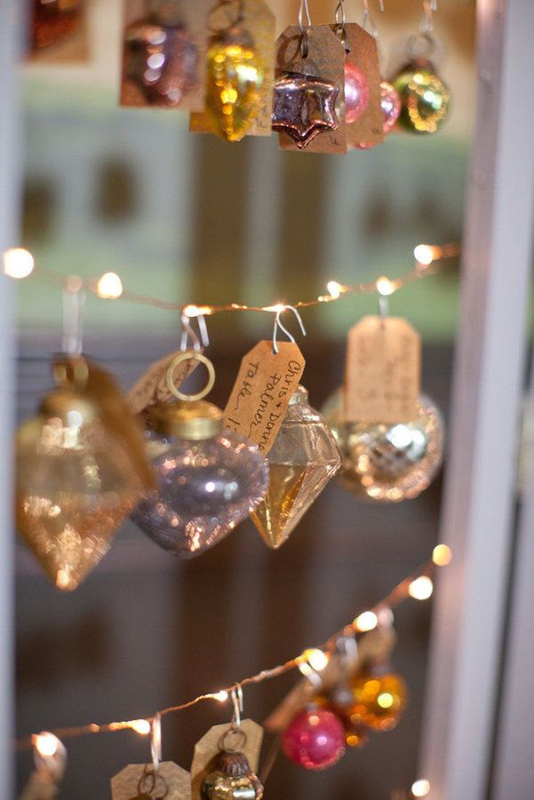 Happy Friday lovelies, have a great weekend! 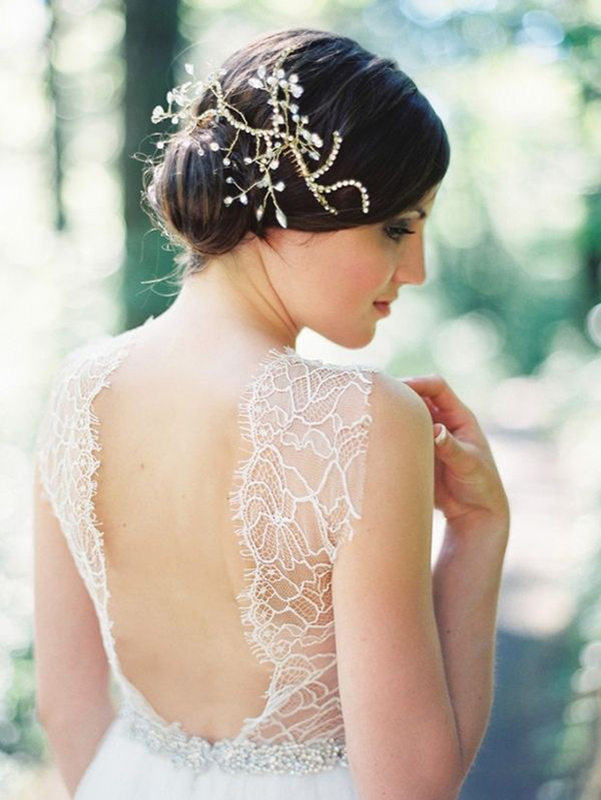 Wow – wedding hair heaven! 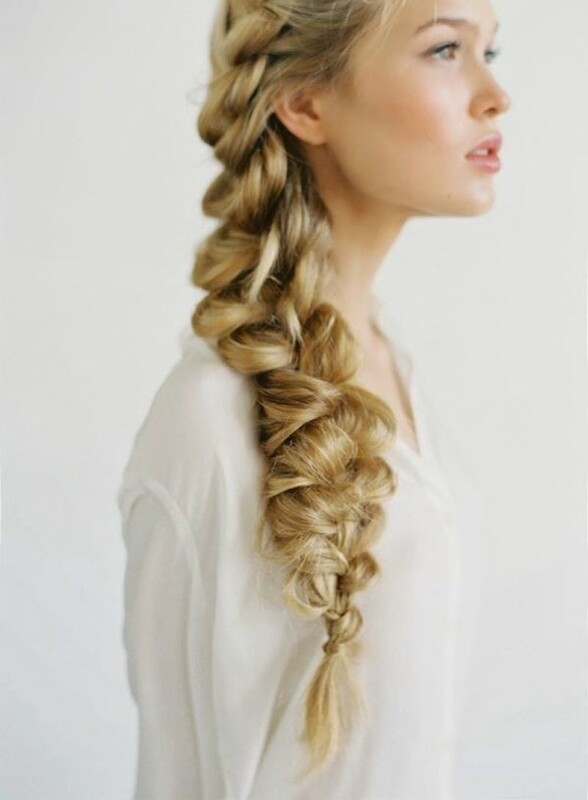 Loving the beautiful braided styles. I have kind of a dilemma. 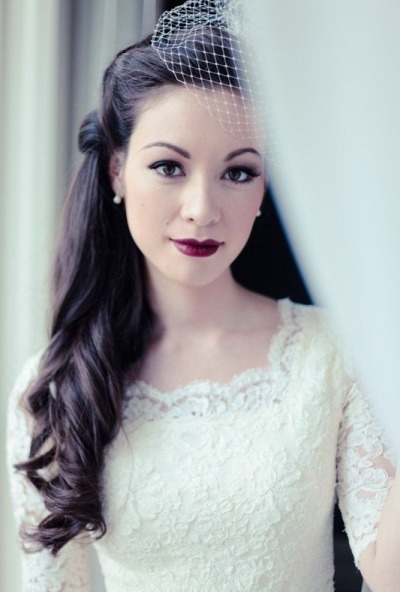 I have a lace-covered, corset backed dress, and I don’t want to distract from that with my hair, but I definitely want a half-up, half-down style. It’s just past shoulder length now, and my wedding isn’t for another year. Any suggestions?